Sun, Z., Wang, X., Yamamoto, H., Tani, H., Zhong, G., Yin, S. and Guo, E. 2018. 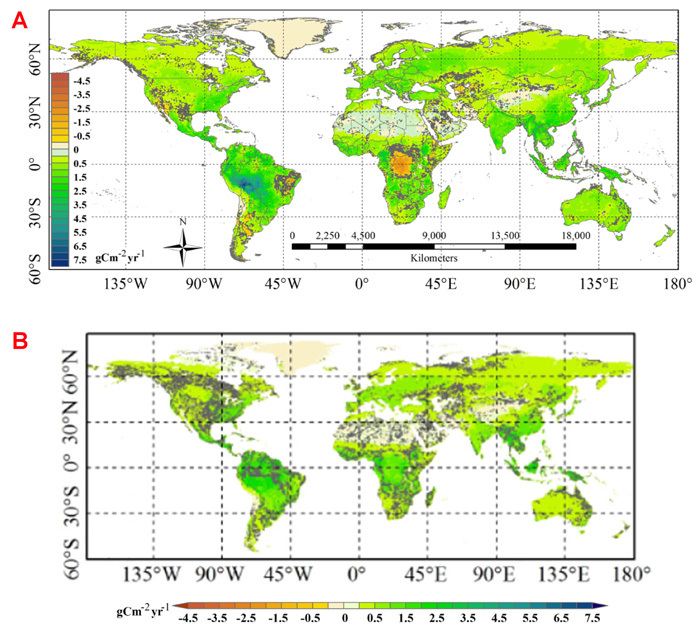 Spatial pattern of GPP variations in terrestrial ecosystems and its drivers: Climatic factors, CO2 concentration and land-cover change, 1982-2015. Ecological Informatics 46: 156-165. Throughout the past year, two research teams (Campbell et al., 2017 and Cheng et al., 2017) evaluated trends in global terrestrial gross primary production (GPP), while the latest group to explore this topic was that of Sun et al. (2018). Seeking to obtain a "deeper understanding of how GPP has responded to past climate change, land-cover change and rising [atmospheric] CO2 concentration," the group of seven scientists set out to improve our understanding of how the carbon cycle might change under future CO2 and climate projections. More specifically, they employed a series of global data sets (sensible heat flux, latent heat flux, air temperature, photosynthetically active radiation, NDVI, land cover, soil moisture and atmospheric CO2) within a carbon fixation model (C-Fix) to estimate global monthly GPP over the period 1982-2015. The results are highlighted in the figure below. As seen in the upper panel of Figure 1, the spatial distribution of the linear trends in GPP over the 34-year period is overwhelmingly positive, demonstrating that a large and significant greening (i.e., enhancement) of vegetation has occurred in over 75% of the land area. As for the cause(s) of these trends, Sun et al. analyzed five potential factors, including land-cover change, rising global atmospheric CO2 concentrations, and changes in solar radiation, temperature and soil water status. Their results indicated, in the words of the authors, that "increases in the atmospheric CO2 concentration make the largest contribution to the globally averaged GPP trend," accounting for 65.73% of the trend (see Figure 1b), which percentage is more than five times the value of the next most significant contributing factor (temperature). In consideration of the above findings, it is therefore quite clear that rising atmospheric CO2 and temperature are both exerting positive impacts on global terrestrial GPP; and there is no reason to believe that such benefits will not continue throughout the decades and years ahead. Figure 1. Panel A: the spatial distribution of linear trends in GPP for the period 1982-2015. Panel B: The spatial distribution of the trends in GPP over this period that are attributed to increases in atmospheric CO2 concentration. Pixels that are not satisfied at p value < 0.1 are drawn in gray.